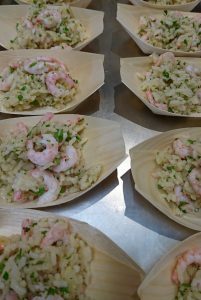 I was fortunate to have been invited to the famous Billingsgate Seafood School who were hosting The Atlantic Canada Seafood Showcase on 30th April 2018. It was one of the most interesting and fascinating workshops I attended in a long time. As a seafood lover I was all enthused and not disappointed for one minute throughout the day. It was informative, educating and extremely interesting and fun with a huge variety of wonderful seafood, their exact origin, texture and taste. We were welcomed by a refreshing glass of bubbly followed by a brilliant introduction to the event and the products we were going to see. We were ushered into the Billingsgate Seafood School demonstration kitchen. The school’s Principal C J Jackson demonstrated some wonderful dishes with plenty of hints and tips on how to choose, buy and treat seafood for safe consumption. 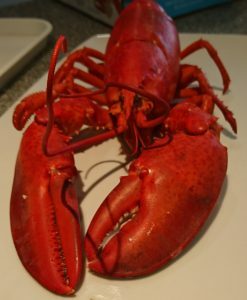 I have never tasted such succulent and sweet lobster as the ones from Wild Atlantic Canadian waters. 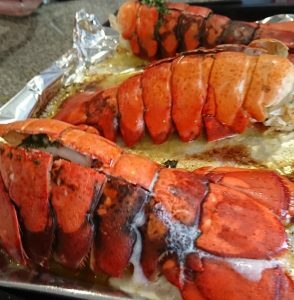 The lobster with potato salad and candied bacon was particularly delicious. The prawns had a subtle colouring, soft texture and sweet clean taste which were developed slowly in clean water. I absolutely loved the prawn and kale salad. It had the most hauntingly pleasant taste and stunning appearance. The snow crab canapes were another taste-bud teaser which I would love to replicate in my kitchen. Red fish was a pleasant surprise to me as I am always on the lookout for firm, sweet and juicy white fish for my Indian dishes. I don’t mind travelling all the way to Billingsgate Market to get some for my spicy dishes! Canadian wines to accompany our wonderful salads and canapes enhanced the whole experience. As a red wine lover, I really enjoyed the easy drinking Phone Box Red from Luckett Vineyards with its concentrated layers of fruits such as raisin and prune. The whole experience was amazing and it is no wonder that Canada today is one of the top exporters of seafood to 23 countries in the European Union.